Note that the column labeled 2014 is in reality the TTM and includes one quarter of 2013, but that’s something I’m unable to fix in Google drive. 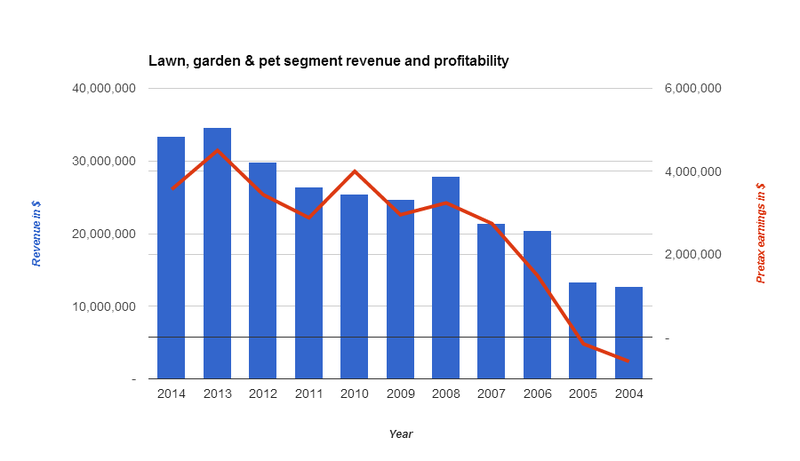 While the lawn, garden and pet segment has grown to be a very large part of Jewett-Cameron’s business the absolute growth of the segment hasn’t been that stellar. Revenue increased from $24.8 million in 2009 to $33.4 million today, representing a 6.5% compounded annual growth rate. If we don’t pick the lows of 2009 as starting point but the previous high of 2008 the compounded annual growth rate drops to 3.2%: not bad, but not great either. The reported segment earnings before taxes also show few signs of operating leverage. Earnings before taxes grew at a 4.0% rate if we start measuring from 2009 and just 1.7% if we start at 2008. With those kind of growth rates just taking the average operating earnings of the past five years or so seems a pretty reasonable approach to me. You need a little bit of nominal growth to keep-up with inflation anyways. I do agree that there might be some positive optionality if the industrial wood segment recovers. I don’t want to call this a free option since the segment has shown declining sales for five years in a row and is a bit below break even. They also do have some excess real estate that they will be able to monetize at some point in the future. But don’t think this is enough to revise my previous conclusion that the company is currently fairly valued. 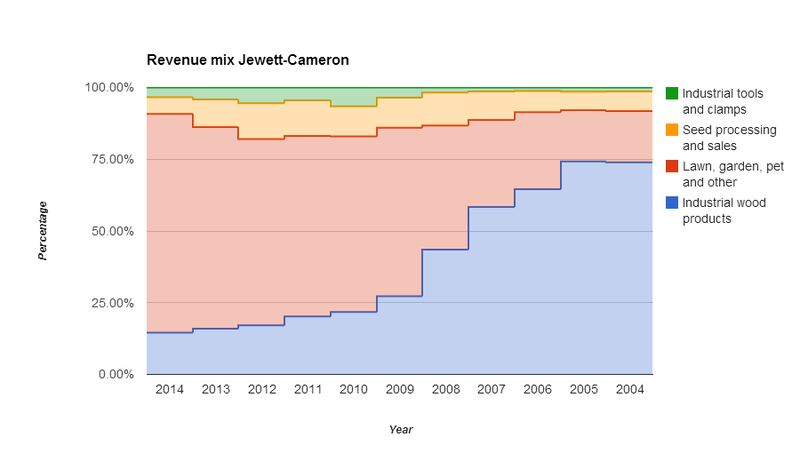 What’s basically the case is that the lawn, garden and pet has been such a big part of Jewett-Cameron’s business for an extended period of time that drilling deeper doesn’t add a whole lot of value. What’s happening in the other segments is almost irrelevant now. This entry was posted in Research and tagged JCTCF on July 20, 2014 by Alpha Vulture. You’re right – I now agree it’s reasonable to take the average of the last 5 years of earnings. You’re also right to say the possible comeback of the wood business isn’t a free option (by the way, management doesn’t the wood business will ever go back to what it used to be), so probably the best thing is to ignore it in the valuation. The real estate is almost certainly undervalued, but I can’t say by how much. The two big properties are the headquarters of the company and the one where the seed business is located, and so perhaps only the second one should be considered “excess” real estate. The seed business was bought, according to management, just because the real estate was very cheap (Don Boone, the CEO, has real estate experience), but let’s conservatively assume it can’t be sold for more than it cost + inflation. It cost $1.5m in 2000, which is about $2.1m in today’s money. We’d have to add that to the valuation. But then we might also have to subtract $1.8m from the lawsuit it seems they might loose, so they more or less cancel each other out. Why calculating revenue and pretax earnings CAGR from 2008, and not from 2004 (and maybe from an earlier time, if you have the data) as shown in the nice table above? Because it’s questionable how relevant that older data is. I meant to write the previous comment in your Ming Fai post. Sorry.